We’ve had 3 officers killed in 13 months, they were all disarmed of the primary weapons. A back-up weapon would have likely made a difference. It’s taken me 13 years and 4 different designs to figure out a system for a back-up holster that fits on you duty belt. Why on the duty belt? Because it is the quickest back-up draw, from standing, on the ground, seated, with a suspect laying on you, chest to chest and more. The one problem is we’re all running out of room on our duty belts… Radio, Gun, Mags, Handcuffs, OC, Baton, Taser, Taser Cartridge Holders, Flashlight, Cellphone and Pager. The FinalOps Back-up Holster it‘s not only the fastest dual retention back-up holster, it can actually take up less room than the same 3 items side by side on your belt. The holster has it’s own belt around the holster that allows you to attach your police tools around 3 sides (2 edges and outside) . 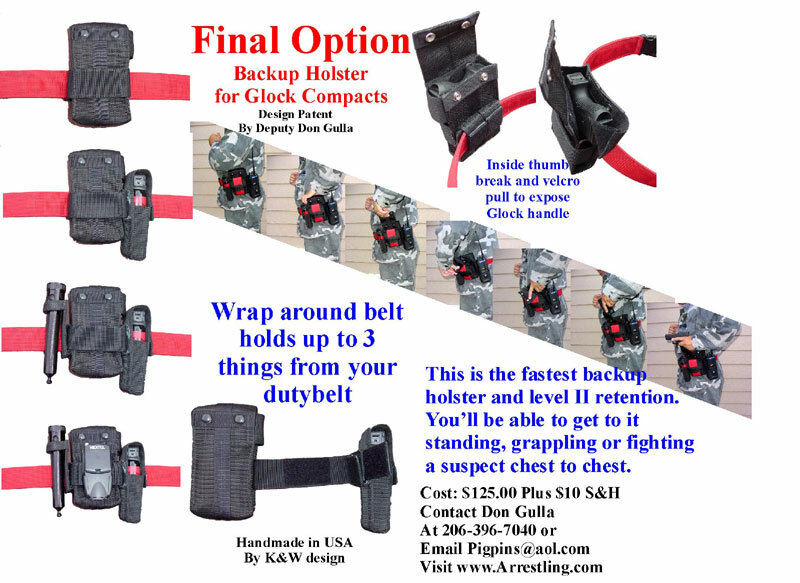 100% Guarantee, if you don’t like it send it back within 30 days and I’ll refund the cost of the holster and shipping.